For those looking to integrate their document management capabilities with Oracle CRM On Demand, ShareMethods is the answer. ShareMethods gives you features such as document version control, approval and review workflows, full text search, document analytics, and EchoSign electronic signature. Your sales people get access to a rich, scalable library of highly relevant sales and marketing documents – without ever leaving Oracle CRM. Custom Web Tabs: A complete view of your documents is available from a custom web tab. Salespeople are taken to a "Document Center" tab that is displayed from within Oracle CRM as shown below. This page displays categories and sub categories of documents stored in ShareMethods allowing a user to drill down into categories or to perform full text searches to find a specific sales or marketing document. Web Links: Using ShareMethods, Oracle CRM On Demand users can seamlessly access sales, marketing, and support materials relevant to a specific Account, Opportunity, or any other object. This can be achieved by setting up "Web Links" in Oracle CRM that perform searches for documents matching key Accounts or Opportunities, or a specific keyword. The user will be presented with a list of sales and marketing materials that are directly related to the Account or Opportunity. 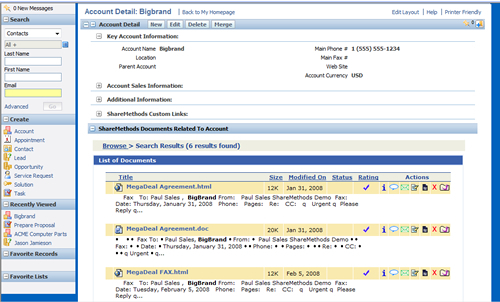 Users can also attach documents to an Account or an Opportunity (or both). A sample screen view is shown below. See our Product Overview page for more details about the document management capabilities that come with ShareMethods for Oracle CRM on Demand. Private Cloud: An on-premise installation option is available for customers who need to deploy the system behind an organization firewall or on a secure network.